George Graham Reviews Martin Simpson's "Prodigal Son"
The English folk scene has been the source of a distinctive guitar style going back to the 1960s. One of the pioneers was Davy Graham who influenced most of the major figures on the scene, including the Pentangle's Bert Jansch and John Renbourn, along with Martin Carthy, to some extent Richard Thompson, and later on people like Pierre Bensusan and more recently John Doyle. The style has sometimes been called "folk-baroque" with its little ornamental turns and trills, and a sound that can sometimes evoke classical music. It often involves alternate guitar tunings that can give the music an almost medieval, modal texture. 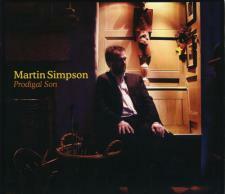 Another figure who has been prominent on the scene for quite a few years now is Martin Simpson, whose new CD is called Prodigal Son. Martin Simpson was born in Lincolnshire in England in 1953, and was influenced by his father's love of music and singing. He took up the guitar at age 12, and the banjo a year later. He became a professional musician in 1971, playing the folk club scene, and by 1976 released his first album. He was soon appearing with Steeleye Span, and by 1977 began a long association with the much acclaimed English folk songstress June Tabor. But it was not just traditional British Isles music that influenced Simpson. Like John Renbourn and Richard Thompson, Simpson was also smitten by American blues and performers like Blind Willie McTell. He moved to the US in 1987 where he stayed for 15 years, recording a series of albums usually in collaboration with others, including Chinese lute players, the band Tarika Sammy from Madagascar, and bluesman Kelly Joe Phelps. Returning to England, Simpson has made his new CD Prodigal Son live up to its title in a way, by getting back to a largely British-Isles traditional sound. And in a departure from his earlier recordings, which were largely or entirely instrumental, most of this CD features his vocals, which are nicely done and perfect for the style of music. Simpson is joined by some notable figures in British Isles folk scene, bassist Danny Thompson, a founder of The Pentangle, along with Andy Cutting and Alistair Anderson on concertinas, plus notable backing vocalists from both sides of the Atlantic, Jackson Browne and current English folk sensation, Kate Rusby. Simpson continues to show his eclecticism with the use of instruments like a banjo and a Dobro-like resonator guitar played with bluesy slide technique. The material is a generous mix of the traditional, including some classic murder ballads, plus some creative reworkings of old tunes, and a handful of original instrumentals. Simpson, as he is wont to do, uses a bunch of alternate guitar tunings, which he spells out in the CD booklet, where he also provides a listing of where he found the traditional songs he included. Simpson also admits to mixing influences and taking liberties with the traditional material -- that is, after all, how the folk music process works. Martin Simpson may not be quite as well-known as some of his compatriots on the English folk scene, but his new CD Prodigal Son reminds us of his talent as a remarkable guitarist, along with his musical eclecticism and versatility. He's also a pleasing vocalist, which was not as obvious on some of his previous recordings. He combines his musical experience and influences from both sides of the Atlantic, collaborates with some tasteful and subtle guest musicians, and also plays instruments like banjo and slide guitar which are normally not part of the this particular style. The result is one of the finest English folk CDs to come around this year on a scene which is still active after nearly 40 years. Nearly four decades after the first albums in the English folk style appeared in the US, the genre remains active and strong, with continued occasional releases by about three generations of artists. Martin Simpson is one of the finest contemporary practitioners of the genre, and his new CD emphasizes the style while still showing his versatility.